Southend United Community & Educational Trust offer a wide range of inclusive education and training models supporting progression at all levels. Our Education Department provides alternative learning opportunities for young people, including vocational and academic pathways. Education courses focus on reintegrating young people into learning or employment, whilst building their CVs and developing transferable key and life skills that will be vital across many of the career paths that the learners choose to take. Regardless of current attainment levels, we operate an inclusive end-to-end education and training model offering entry-level programmes, Princes Trust Team, Traineeships, Apprenticeships, BTEC courses and even Degree level qualifications – we’re here to inspire people to achieve their potential. 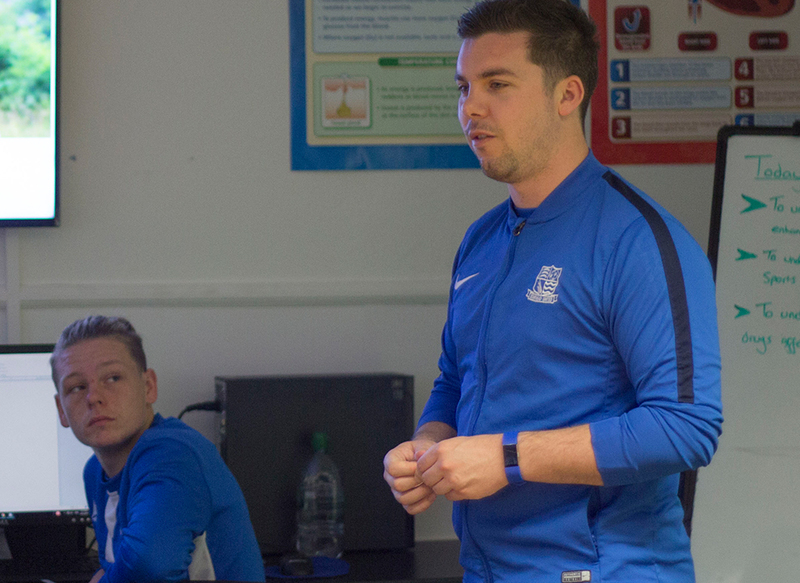 Using the brand of Southend United Football Club, SUCET engages with young adults by offering them the opportunity to continue their studies at Roots Hall and gain qualifications. The qualifications offered are BTEC level 2 or level 3 courses in sport. The level 2 course in sport is completed in a year, while the level 3 three courses is completed over two years. The level 3 course consists of a Subsidiary Diploma, which is achieved after completing year 1 of the course and the Extended Diploma which is achieved after completing year 2 of the course. As part of the course the learners will also represent Southend United Community and Educational Trust in Football and Futsal matches. One of our students who is now a level 2 coaching apprentice said ‘Studying at Southend United is different to any other college or school programme. You get to study at a football stadium and wear a club tracksuit so you feel like a true professional’. Several learners have progressed to Apprenticeships with Southend United Community & Educational Trust, where they work as coaches while completing their NVQ level 2 in Activity Leadership and then NVQ Level 3 in PE in School Sports. Jack who is a level 3 coaching apprentice said ‘My favourite part about working for SUCET is knowing that every day I come into work I will have made a positive effect on at least one child’s life through the power of sport’. During the twelve weeks Prince’s Trust Team Programme, young people aged 16-25 take part in a variety of activities that are designed to help them develop and improve their communication and teamwork skills as well as confidence. The young people work towards a nationally recognised qualification – Prince’s Trust Certificate in Employment, Teamwork and Community Skills. The programme involves a week-long activity residential as well as planning and completing a community project, work experience and completing a portfolio of evidence. ‘Before I started the Prince’s Trust Course my confidence was at an all-time low. The course has given me confidence and a job’. After successfully completing a work placement at WHSmith’s the young person was offered a part time job. Our Traineeships are used as a direct progression from our Princes Trust TEAM programme. The programme is designed to offer opportunities according to individual need and ability and to enable progression to other courses offered. The programme aims to help young people develop work and life skills whilst they take on several challenges and meet new people. With the aim they will move into both volunteering and education. We can accommodate young people from Southend and the surrounding area of South East Essex. The programme consists of residential activities as well as the planning and running of a social action project. Previously teams have completed projects such as decorating a community youth centre and running a community fun day as well as raising considerable funds for local charities such as HARP, Southend Hospital Charity & Southend YMCA. Speaking at a recent graduation event, local councilor Dereck Jarvis expressed “I have never seen so much drive and enthusiasm from young people in one room”.